"Virtual Twilight helps real estate professionals present gorgeous exterior photography of a home, even when the weather is problematic and conditions are not perfect for VHT Studios’ traditional twilight photography"
VHT Studios today debuts Virtual Twilight, the newest service in the company’s Virtual Staging Suite that helps real estate professionals move homes faster and make their listings stand out from the competition. VHT Studios has always offered traditional twilight photography, and the rollout of Virtual Twilight gives real estate professionals even more flexibility to best serve sellers while stirring buyers’ emotions through stunning real estate photography. Virtual Twilight wows buyers through warm, romantic and welcoming exterior views of listings that appear to be photographed at dusk, the precious and magical moments between sunset and nightfall. Please checkout this striking gallery of Virtual Twilight photography for a variety of homes. Virtual Twilight is another convenient alternative to VHT’s traditional twilight photography sessions. VHT uses our professional photographers’ daylight exterior photographs and our image specialists digitally transform them into twilight photographs. It saves time for the seller and real estate professional, since it requires no additional or extended late-day photography sessions. Virtual Twilight is also a more economical option for real estate professionals who otherwise might not have considered a traditional twilight photography appointment for specific homes. VHT Studios CEO and co-founder Brian Balduf says Virtual Twilight is the company’s newest marketing tool aimed at providing even more convenient and cost-effective services that capture buyers’ attention in yet another way to help agents sell homes faster and grow their businesses. 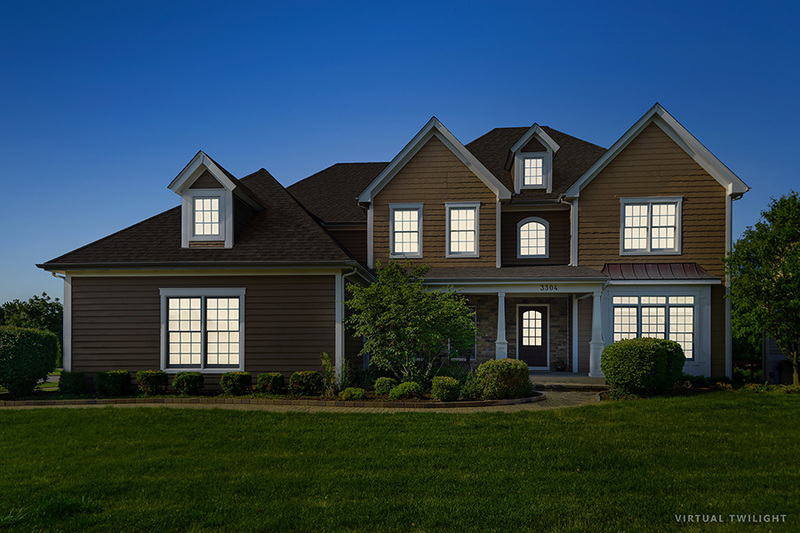 “Virtual Twilight helps real estate professionals present gorgeous exterior photography of a home, even when the weather is problematic and conditions are not perfect for VHT Studios’ traditional twilight photography,” said Balduf. “The weather forecast is no longer a concern when capturing the beauty of a home’s exterior at sunset,” said Balduf. - Virtual Staging decorates vacant spaces in any style and offers the benefits of traditional staging at a fraction of the cost. - Virtual Declutter removes clutter and “depersonalizes” living spaces. - Virtual Paint changes the color of any flat surface in a room. - Virtual Redecorate magically transforms any room with wide-ranging design styles and furnishings that are most likely to attract buyers. VHT Studios’ image specialists create their magic with tools and skills that present a home at twilight, by enhancing exterior photographs with artistic, yet realistic touches so a home appears as a welcoming beacon against a stunning backdrop of sky and landscape. Virtual Twilight boosts a listing’s WOW factor by appealing to buyers’ emotions and dreams about their next home. To view a high-resolution photography gallery of VHT’s Virtual Twilight and other products in the Virtual Suite, please click here. Prices for Virtual Twilight start at $39 per photograph. VHT Studios unrivaled nationwide network of professional photographers and image specialists deliver photography and image management services to top real estate professionals looking to become even more successful. VHT Studios is a full-service partner to leading real estate agents, brokerages and businesses. The VHT Studios team delivers to real estate and business professionals their most powerful selling tools – high quality photography and video – to ensure their properties get seen more, sell faster and at the best price. Based in Rosemont, Illinois, VHT Studios has helped more than 200,000 real estate and property professionals sell more than $200 billion in properties since the company’s founding in 1998. For more information, please visit VHT.com, or find us on Facebook, Instagram, Twitter and LinkedIn.